Where is the best place to put your money for retirement? Ask a lot of people and the automatic response is that you should put your money in a pension to get a bigger retirement pot which comes from the tax advantages given by HMRC. I however am not convinced and in fact believe the government and the pensions industry is actually close to misleading the public as to the advantages of pensions. For some people they seem to provide big advantages which in my opinion outweigh many of the negatives and risks with pensions. Personally I use a pension as part of my retirement investing strategy however I don’t have all my eggs in one basket and have about 34% of my total assets within a pension tax wrapper. However I believe that for many people the benefits could be marginal (maybe even negative in some instances) and if I was in that position I would not touch a pension. To me the advantages of a pension are really quite simple as it’s essentially nothing more than a tax deferral scheme. The theory is that you contribute to the pension today, tax free, and then some day in the future you withdraw the money and are then taxed on it. The only other carrot I think of is that when it comes time to withdraw at some distant date you can currently take 25% of the pension pot saved tax free. - At retirement I won’t get access to my pension pot but instead can only purchase an annuity or an unsecured pension (USP). The only exception I can think of is if you plan well in advance and don’t intend to retire in the United Kingdom you may be able to transfer your pension pot to a Qualifying Recognised Overseas Pension Scheme (QROPS). QROPS is something that is highly likely to be used by me. - To me the rules seem complex and can be changed at anytime by the government. The government have also proven that they will not leave pensions alone and will be constantly tinkering. - I have no idea what tax rates will be in the future. - Governments can change the allowable retirement date. If I’m targeting a particular date and only save in a pension then I could be very disappointed. - I will be very limited as to what you can pass down to future generations. For example if I bought a standard annuity at retirement and died the next day nothing could be passed down. I think the best way to demonstrate if a pension might suitable for someone is for the individual to sit down (with independent advice of course) and carry out some analysis looking at different options. I can very easily imagine that every single person in the UK being different. Today I’m going to demonstrate how I look at pensions with 2 examples as I understand the rules. The first is Average Joe who is very similar to me. He is a 40% tax payer whose employer allows him to salary sacrifice. He also gets some advantages from his employer for contributing to a pension. The second person is average Bob who is a 20% tax payer who contributes to his pension out of net pay and gets no advantages from his employer for contributing to a pension. - I am going to assume that that the investments are made into a balanced type of asset allocation. I will therefore assume the nominal average returns that can be expected will be 8.6% per annum. - For consistency I am going to assume the pensions are both Stakeholder Pensions (rather than for example a Self Invested Personal Pensions – SIPP’s) where the government allows the provider to charge fees of 1.5% for the first 10 years and 1% thereafter. I will assume the provider is ‘generous’ and only charges annual fees of 1% over the life of the pension. - It was very easy for me to get a Stocks and Shares ISA (S&S ISA) that has zero annual fees for providing the tax wrapper. It is also very easy to buy a series of Exchange Traded Funds (ETF’s) and build a balanced asset allocation for fees of less than 0.5% per annum. Therefore I will assume 0.5% in the examples below. Let’s assume average Joe earns £50,000 and his employer allows him to salary sacrifice £2,000 of his pre tax earnings annually into his pension pot. Were he to take this £2,000 as salary (and later invest into an ISA) he would pay tax at 40%, national insurance at 1% plus his employer would pay national insurance at 12.8%. Joe’s company is generous and agrees to match his commitment of £2,000 every year. They also offer a Salary Sacrifice arrangement allowing Joe to reduce his salary and in exchange his company will invest into his pension on his behalf. This means he doesn’t pay tax on the contribution but also importantly he doesn’t pay national insurance either. Finally as his employer hasn’t had to pay the 12.8% employers national insurance they generously agree to contribute this to Joe’s pension also. Running the maths means that if Joe chooses to commit £2,000 of his before tax earnings into his pension pot annually he actually ends up with £4,256 going into the pension. On the other hand if he chooses to contribute to an ISA he pays tax and national insurance and ends up with £1,180 going into the ISA. That is a very significant difference. Now Joe continues his contributions, lets compound interest go to work and in 30 years looks to retire. Joe has been very careful to ensure that he is only a 20% tax payer in his retirement as he already owns his house and can live relatively frugally. He has also not put all his eggs in one basket and so has invested outside of his pension and receives enough earnings from other investments plus the state pension (he made enough NI contributions) to use up all his tax free allowance. Joe’s pension pot has compounded to £482,205. He chooses to take the maximum tax free that he can which is £120,551. With the remainder he can then choose either an annuity or a USP however whatever choice he makes he has already used up his tax free allowance and so his pension will be taxed at 20%. He won’t have to pay national insurance on his pension. So allowing for this 20% tax rate on all his subsequent USP or annuity payments his effective total available pension pot is £409,874 compared with £147,179 if he had have saved in an ISA. That’s an increase of 178% which for me makes it worth using for part of your retirement investing strategy and compensates for the negatives of pensions. Let’s assume average Bob earns £30,000 and intends to also invest £2,000 of his pre tax earnings annually into his pension pot. Were he to take this £2,000 as salary (and later invest into an ISA) he would pay tax at 20%, national insurance at 11% plus his employer would pay national insurance at 12.8%. Joe’s company is not generous and does not help him with his pension arrangements. He therefore has to pay tax and national insurance at the full rate (£620), make the pension contribution and then let the pension company gross up the contribution (effectively claim back the tax) by 20% or £345. 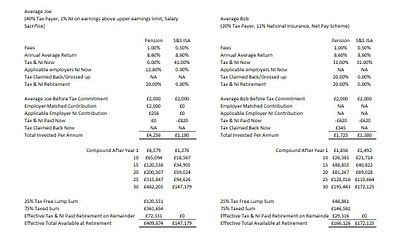 Running the maths means that if Joe chooses to contribute £2,000 of his before tax earnings into his pension pot annually he actually ends up with £1,725 going into the pension as he still has to pay the national insurance of 11%. On the other hand if he chooses to contribute to an ISA he pays tax and national insurance and ends up with £1,380 going into the ISA. Now Bob continues his contributions, lets compound interest go to work and in 30 years also looks to retire. Bob has also been very careful to ensure that he is only a 20% tax payer in his retirement. He has also not put all his eggs in one basket and so has invested outside of his pension and receives enough earnings from other investments plus the state pension (he made enough NI contributions) to use up all his tax free allowance. Joe’s pension pot has compounded to £195,443. He chooses to take the maximum tax free that he can which is £48,861. With the remainder he can then choose either an annuity or a USP however whatever choice he makes he has also already used up his tax free allowance and so his pension will be taxed at 20%. He also won’t have to pay national insurance on his pension. So allowing for this 20% tax rate on all his subsequent USP or annuity payments his effective total available pension pot is £166,126. What is really surprising however is that he would actually be better off if he had of just invested in ISA’s where he would have investments totalling £172,125 which he could withdraw tax free when and how he likes. By having the pension he is worse off plus he also still has all the negatives of pensions as explained previously. - A key element of my retirement investing strategy is to minimise fees and tax which erode the effect of compound interest. As with any of my investments I’m watching both. - In my experience stakeholder pensions tend to charge higher fees on the investments within the wrapper than equivalents (exchange traded funds – ETF’s etc) that can be bought in an ISA or outside of any pension wrapper. - A pension doesn’t automatically appear the best vehicle to save for retirement. - Always, always, do your own research. One size does not fit all. - If you do want to save into a pension it seems worthwhile to explore whether getting your employer to set up a salary sacrifice scheme to save the national insurance could benefit you. However with every complex investment there are things to watch every step of the way. For example with salary sacrifice schemes there also seem to be some negatives. It looks like statutory benefits could be affected because taxable pay is reduced. Also, the state second pension could be affected if you earn between the Lower and Upper Earnings Limits. Also it doesn’t seem beneficial to set one up if paid below the National Minimum Wage or the Lower Earnings Limit. Finally, pensions are very complex things. I personally use them and I have tried to demonstrate why they suit me based on my research only (remember I am not a financial adviser, only an average Joe). However, as they are very complex I may have misunderstood an element resulting in an incorrect calculation in the long example above. If you do spot an error please post a comment so that I can correct it. I also would also encourage readers to post general comments as I was quite surprised with what I saw once I ran the numbers. I believe there is an interesting other option of building up a fund via an ISA, then in the final year before retirement becoming a higher rate tax payer for that year only through either a pay rise or self assessing, then putting say half the pot into the pension attracting tax-back at a 40% rate, before taking the 25% tax free sum back the following year. How does one suddenly become a higher-rate taxpayer at a time convenient to the taxpayer? Seems most improbably for most employees! Nice post. I am base rate tax payer and employer is matching my pension contribution 6%-6%. So I fall to average Joe instead of average Bob category. I am only 2nd year in the scheme but it pays off nicely already. You can't just remove Bob's £48,861 tax-free lump sum from the equation. Including this makes the pension loads better than the ISA. Thanks for the comment. Note that Bob's allowance hasn't been removed from the equation completely but just removed from the pension to get the tax free allowance. I still count it when I sum the benefits. Have a look at the bottom right of the image. After 30 years he has £195,443. Of this 25% or £48,861 is removed as a lump sum which could then be put in other tax friendly areas (ISA's, Index Linked Savings Certificates) or maybe even to used to pay off a mortgage. The remaining 75% of £146,582 has to have an effective tax of 20% or £29,316 (note it's only effective because the tax is not paid until the money is removed from the pension) subtracted. So £48,861 + £146,582 - £29,316 = £166,126 which is worse than the ISA route in this example. In a previous anonymous comment I said pension was taxed twice as much as ISA. I implicitly assumed NI not paid on income going into a pension, i.e. salary sacrifice available. Even if that's not the case, pension still wins. Now that I've glanced at your figures, you make pension lose by assuming higher charges. Not sure what the justification is for that. My pension account is cheaper to run than my ISA, and the fund fees are the same in both. Comment 1. This post was written a little while ago when NI was 11%. Could you please clarify your logic that income into a pension is taxed at 15% for a 20% tax payer as I don't follow? My understanding is that no changes have been made by the government in this area and Average Bob above can claim back the full 20% tax. Comment 2. Paragraph 2 is the key to this comment. With this post I was just trying to highlight that everyone is different and why it is so important to DYOR not just believe industry hype. The fees in the example above are close to my real life scenario. I have an employer funded Personal Pension where I can't choose the provider and am charged fees of at least 1% depending on the funds I invest in. I'm aware that with a SIPP I could do a lot better as I wrote here http://retirementinvestingtoday.blogspot.com/2010/08/lowest-cost-low-cost-sipp.html however it's currently not an option. In contrast my S&S ISA provider does not charge me a fee and I hold ETF's with average fees of around 0.5% in the wrapper. So my situation is exactly the opposite of yours. I think our 2 different cases demonstrate perfectly why one must DYOR. This type of strategy is loosely termed as 'taking advantage of free money', and is frowned on if not banned by HMRC. Any tax strategy that seems to arbitrage year-on-year tax rates on contributions and benefits will possibly fall under this bad heading, and should be avoided. I would definitely recommend one seeks advice before trying this. There is the three year ban by HMRC on people, say, taking out loans to put into the pension fund, with the idea of paying off the loan outstanding with part of the tax-free lump sum. This is to stop people reducing their income tax in those final years with extra pension contributions from money that is not from income. The reason I said earlier that pension income is taxed at 15% is that you pay 20% (basic rate) tax on 75% of it, the other 25% being tax-free (as a lump sum when you start taking your pension.) 20% x 75% = 75% x 20% = 15%. The inability of people paying into a pension to be able to access that money easily (or at all) prior to retirement is seen, conventionally, as a disadvantage that ISAs do not suffer. However, given the economics 'law' that people have a preference for immediate consumption, it would appear that this restriction is rather a good thing as it removes temptation to fritter the money away prior to retirement. Additionally, the pension fund is a way to keep the money away from creditors should one fall into bankruptcy, and from, to a degree, ex-spouses on divorce. The analysis of Bob's situation is flawed. You mention his taking 25% of the pot tax-free, then ignore that when computing the income-tax rate. Bob pays 20% income tax on the income generated by 75% of his pension pot, and 0% tax on the consumption of the 25% tax-free lump sum. Taken together, this reduces his tax rate on income generated by the pension to 15%. Pensions have a 5% tax advantage over ISAs, all things being equal, for basic-rate taxpayers. 1. What we have here are two extremes AND I assume the benefit Average Bob gets (£6K over 30 years)is due to the fact that he paid the tax on the way in and so (unlike the pension) this didnt get compounded over the years. 2. For Average Bobs advantage he has to decide/manage his investments for 30 years...this equates to £200 pa in 'pay' for doing so AND assumes that with his 'expertise' he will perform as well as the professionals running his pension.